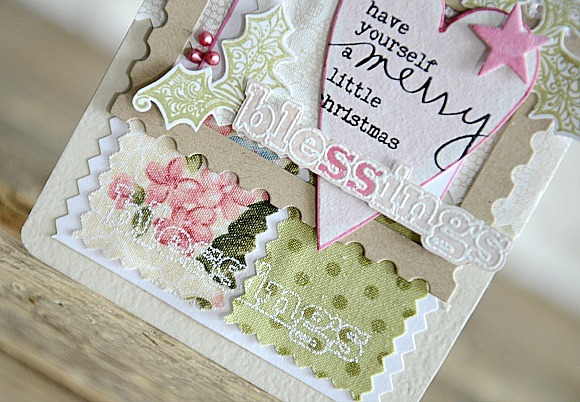 So excited to be sharing with you my creations to help kick off the PaperHaus 12 Days of Christmas celebration! If you don't know much about this magazine, head over here to check it out! 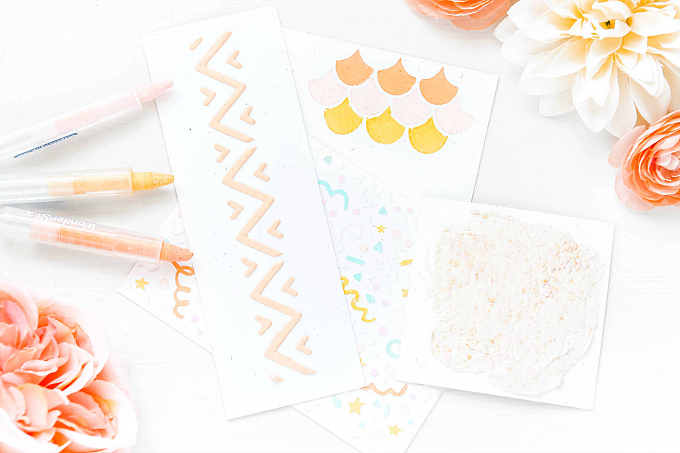 The brand new issue has JUST been released, and it's full of inspirational projects and so many lovely ideas! 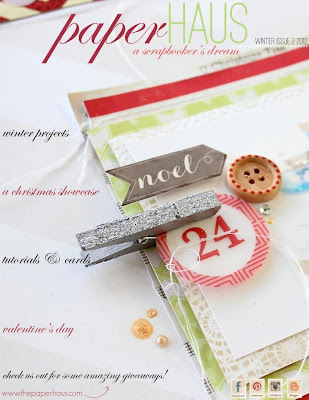 The magazine is also hosting an event that officially starts today (12 Days of Christmas), so join us every day for the next 12 days for great projects on both Facebook and on the PaperHaus blog, as well as fun giveaways! Here are some of my most recent projects I've created with the holidays in mind. I haven't been able to put down my Stitched Sentiments #2 stamp set from TCM, so I've used that quite a bit on this card, stamping and embossing on the fabric first, as well as on some pink cardstock - with a couple of the letters colored in with my Copic markers. Next up, a much lighter card, with the same basic ingredients. I added another one of my hand-stitched felt hearts, which I decorated with ribbon, buttons, and leaves of holly. So festive, don't you think? 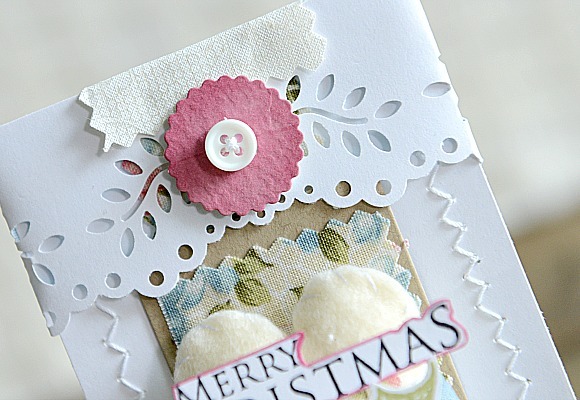 For the top of the card, I added a punched paper overlay, with some colored chipboard, and a button. Please don't mind my horrendous stitching - I swear I only get worse each time I attempt to sew! But I can't help how much I love the look, so even if the stitches are uneven and the lines aren't straight - I can't promise that it will be enough to keep me away from adding a stitch or two to my projects every now and again. Next up, a little baggie I stitched up (except this time I covered the stitches), and added a few embellishments to the front. I have several tags hiding inside this baggie, stamped with various gift-giving sentiments....Just in time for the holidays! 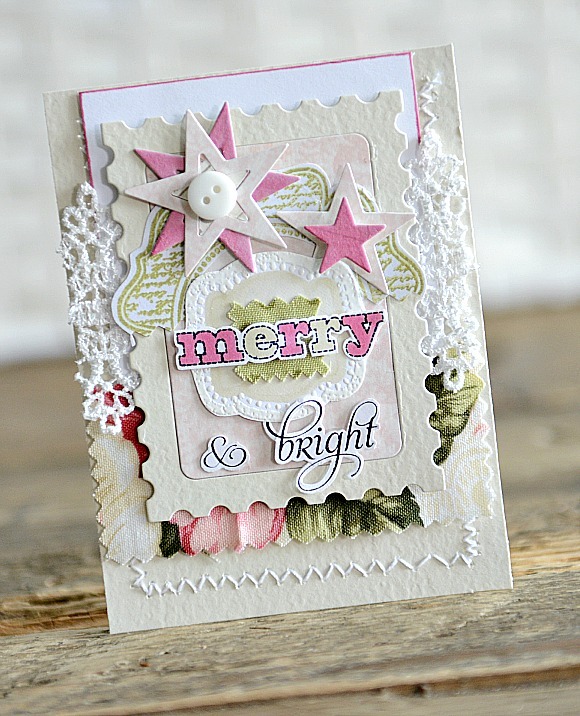 Another card in festive colors, with plenty of die-cut stars, some more fabric and a lovely lace trim. 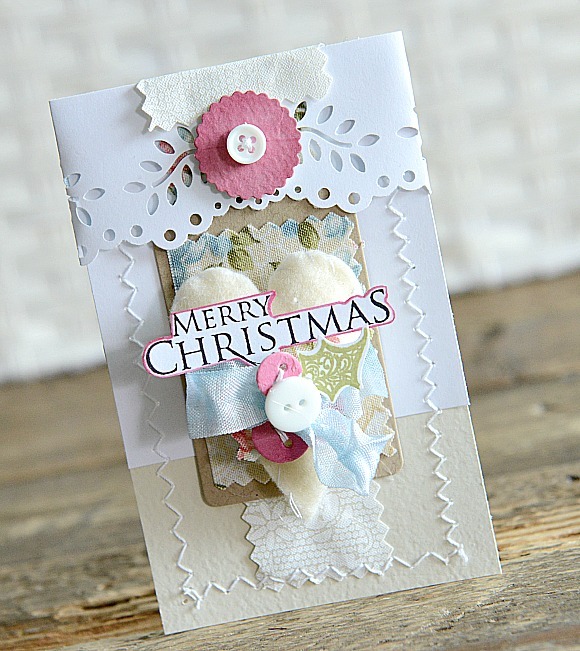 I used the TCM Stitched Sentiments #2 on this card as well for the greeting. I used Copic colors to fill in the stars and the sentiment. I have been really having quite fun with my Copics lately. Although I cannot promise that I will ever graduate to shading and creating lifelike images, I rather like the freedom I have with the markers and that I can color-coordinate just about anything. For my last card in this series, I have one last, quite layered card, to show off. I loved the color combination so much, that I couldn't help creating all of these projects. Ever feel that way? When you discover a set of colors, of materials that you really like, and can't seem to put them down? 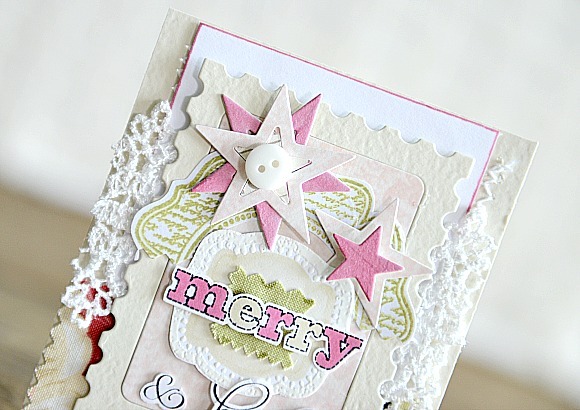 I stamped the tree from this Pink Paislee stamp set and embossed it in white. 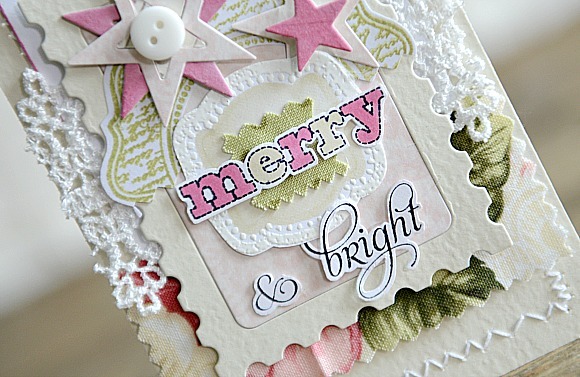 Then I added some more fabric and lace, as well as a few die-cut stars form this MFT die set. 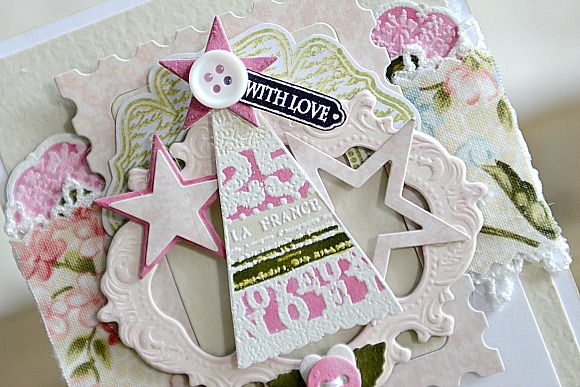 I cut out the "with love" sentiment from this Maya Road stamped image. The frame is a Tattered Angels chipboard that has been retired, but luckily I have a few more in my stash and I try to use them sparingly. This particular one, I colored with my Copics to match the cardstock I used, and it worked perfectly - also it's much quicker (and cleaner) than inking or spraying. Lastly, I added another sentiment from the Stitched Sentiments #2 stamp set, and die cut the button, and mini leaves from this Spellbinders die set. The miniature heart is from this Sizzix set. Here is a picture of the BRAND NEW cover of the December 2012 PaperHaus Magazine Issue, you can click here to check out the magazine and all the beauty that lies within! I hope that this is a good start to your 12 Days of Christmas and I hope you'll come back and join PaperHaus each day to check out more beautiful work!!! Wow so many beautiful projects, gorgeous work as always. 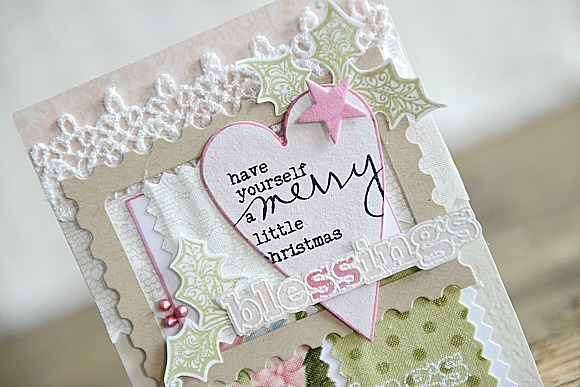 What a gorgeously Sweet collection of cards! 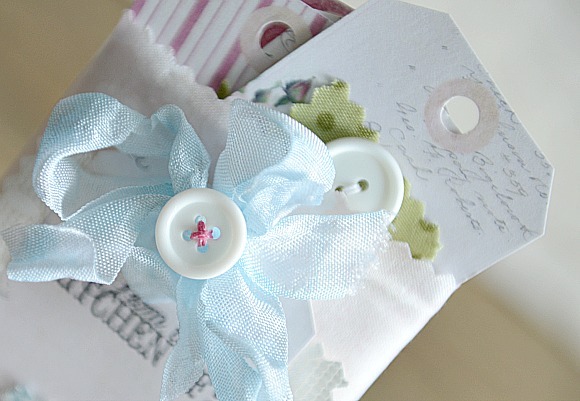 I love your soft colors and your stitching is terrific! Wow! So much beauty! I love your work Ivana! Gorgeous cards! 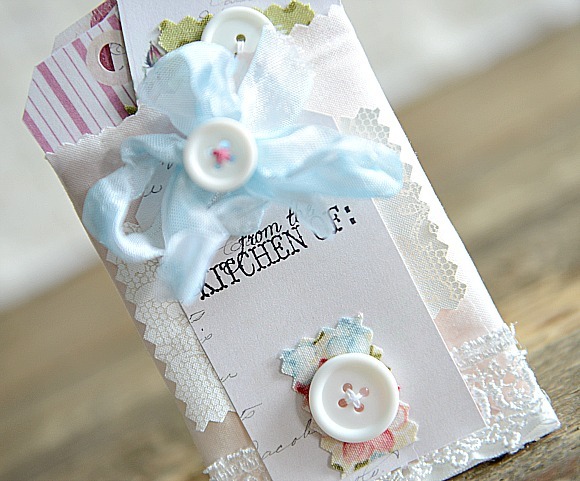 LOVE all the lace and ribon.The Stitched Sentiments are a nice addition too. Ivana! 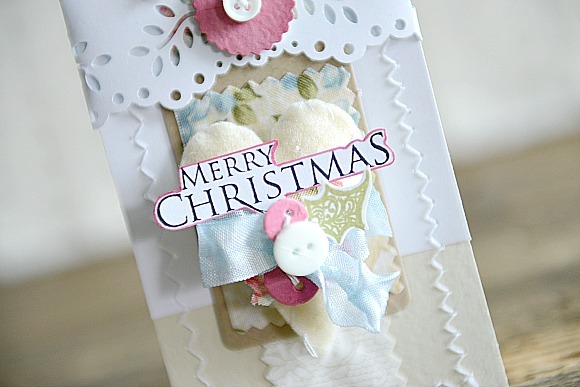 So gentle, delicate and noble colours, wonderful cards!!!! !